Matt Hubbard reviews the Volvo V60 D6 Hybrid, which is actually a plug-in hybrid. The future of motoring is slowly taking shape in front of our eyes. The basics of car design will continue to be refined but will essentially remain as it is - seats, body, wheels, power unit. The fundamental problem in future cars comes down to one of energy storage both at car and distribution level. Petrol and diesel are relatively easy to extract and refine and extremely easy to transport and store. Once in the car it stays where it's meant to until it is used, at which point it is quick and easy to replace. Enough can be stored in a car to give a range of hundreds of miles without the need to refuel. Petrol and diesel also have a large amount of energy stored within their mass, and extracting that energy is as easy as setting fire to it. Emerging technologies and fuels have to match existing fuels in terms of storage, range and price - or else the market will not adopt them. Electricity is in many ways a better fuel than anything else to power a car. It requires few moving parts in the drive train and will ultimately lead to lower running costs. It also provides a smoother driving experience and produces no pollution when it is used (although it sometimes produces lots when generated). But mankind has yet to suss out the problem of quickly refuelling a car with electricity, and storing enough on board to match the range of a fossil fuelled car. Until that happens electric vehicles are folly. And until that point we are stuck with hybrids which utilise electricity until such point it runs out, whereafter a petrol or diesel engine takes over. The two engines can also be combined for more and better power delivery. Some companies (Toyota and Honda) have been making hybrids for years whilst others resisted (mainly due to being smaller companies with lower R&D budgets) and waited until the technology was mature enough that it cost less to introduce it. Nowadays most manufacturers have at least one hybrid in their range. Some hybrids look the same as any other car and some look...different. Some cost a little bit more than a standard car whilst others cost the earth. Volvo has taken the approach of making its hybrid V60 look the same as any other V60 - to an almost fanatical degree - but it does cost the earth. Volvo has also taken the bold approach of giving its hybrid more performance than the rest of the range. Until the V60 Polestar came along the V60 Hybrid was the most powerful, as well as most expensive, V60 you could buy. If you want to know what the standard car is like read my review of the Volvo V60 D3 here, and you can check out my V60 Polestar review here. Visually the Hybrid is almost identical to any other V60. The only differentiators are small 'Plug-In Hybrid' badges on the front quarter panels, an extra fuel flap, a much higher boot floor and more badges on the door sills. The extra fuel flap (under which is a plug) and badges mean this is a plug-in hybrid, which means you can charge the battery up (in around 3 hours) and it'll provide around 30 miles of purely electric motoring. That leads to an official economy figure of155mpg and emissions of 48g/km of CO2. Stunningly low but meaningless in the real world. In practice the V60 D6 Hybrid is a sensible, practical, fast, economical, cheap to run car that costs a lot but has a few benefits over a standard car. The only real inconvenience is the reduced boot area. My border collie came for a ride and wasn't too impressed with having to stoop down low in the boot. A V60's boot floor is quite high in the first place. In the hybrid, with even more height, it looks (and is) a bit ridiculous. The battery and electric motor live under the boot floor - hence the height - and power the rear wheels which means in certain modes the car is four wheel drive. Of course, the diesel engine up front powers the front wheels. The electric motor has 70bhp and the diesel engine has 215bhp. 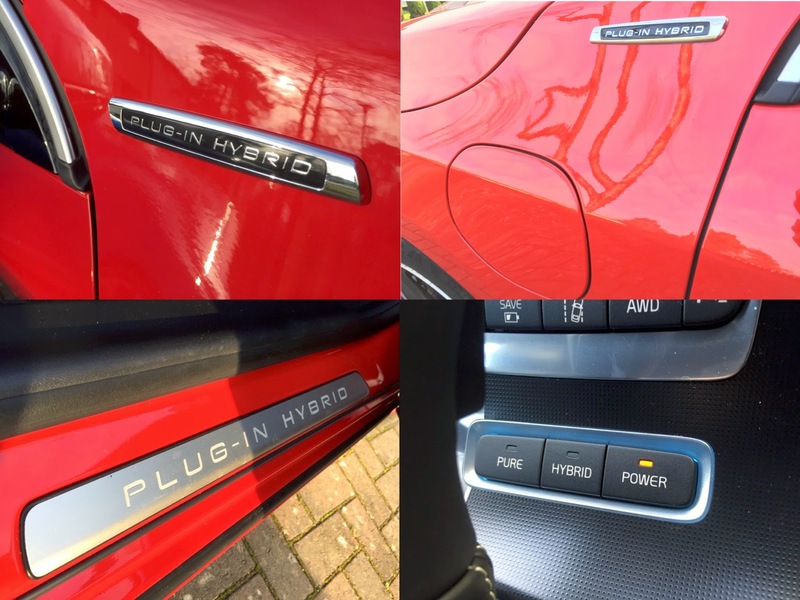 Select the Power setting and the V60 hybrid is a 275bhp, 471b ft, four wheel drive continent crushing estate car with the comfiest seats in the business and a fabulous interior. Power and torque are felt from low down, with minimal lag away from the line. The gearbox is sweet and the steering slightly heavier than you'd expect. Steering feedback and handling are lacking in favour of a smooth ride and safe understeer but boot the throttle and it's fast, grippy and great fun. With all that grunt you can overtake where you couldn't in most cars. Select the Pure setting and it'll use the electric motor as much as possible, resorting to diesel assistance only when you press the accelerator more than about 50%. I found myself driving in EV mode through towns and villages and pressing POWER when hitting the 60 zones in between. Trying not to allow the diesel engine to kick in gives an added dimension to driving the car. Gently does it on the throttle and keep momentum up as much as possible makes boring roads slightly more interesting. In between Power and Pure you can just drive the V60 as a hybrid, with the diesel and electric engines operating independently or together depending on your speed and heaviness of right foot. I tested the EV mode and battery capacity on a run. On purely electric power I drove 6 miles round twisting country lanes and 14 miles at 65mph on the motorway before the battery was exhausted and the diesel engine kicked in. After another 20 miles the battery had replenished one third of its capacity which allowed me to cruise another few miles in EV mode. You can feel the extra 200kg weight of the hybrid system when driving round bends but not so much when braking. The brake pedal feels strange at first as it is both battery regenerator and conventional discs n'pads brake. The diesel engine is the old 2.4 litre unit which was never the most refined or economical of engines. The Volvo V60 D6 Hybrid is a fantastic car to drive - I'd happily own one if it didn't cost so much - but it could be improved massively by using the new D4 2.0 engine. In Power mode you'll average 35mpg if you drive enthusiastically. Volvo has shown its hand and that means its hybrids will not be radically different cars from the rest of its range. Instead Volvo acknowledges hybrids as being a mainstream part of the medium-term future of motoring - so why make them different? We'll see a hybrid in the new XC90 SUV and soon after most of the Volvo range be available with hybrid engines (and probably EVs too). That this, the first Volvo hybrid, is such a good one bodes well. As an experiment, and a car that will mostly be bought by early adopters who don't want to look too different, the V60 Hybrid is a resounding success that could be improved in a couple of areas, namely by using a better engine and by packaging the battery better.